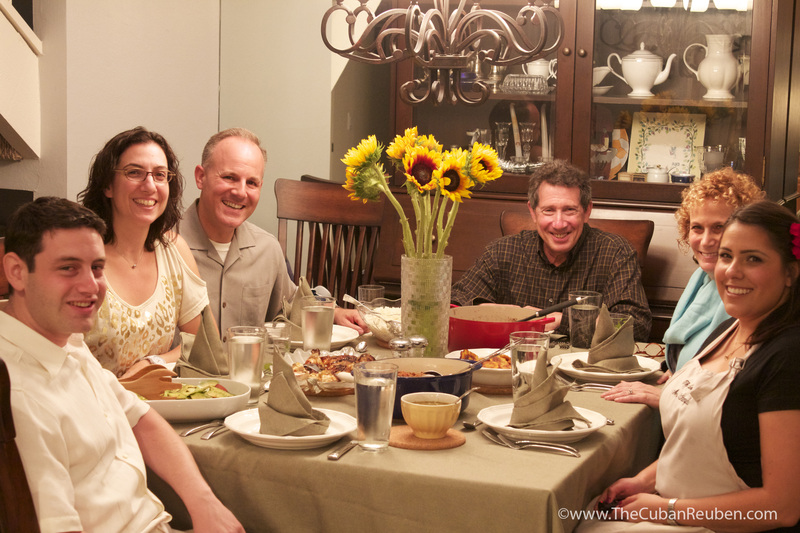 Saturday Night Dinner Party: Cuban Themed! This past weekend, Kenny and I hosted some friends for a casual Cuban-themed dinner party at our home. Despite never having met each other, we thought that the two pairs might find some common ground for a couple of reasons. First, they are both active leaders within the global Jewish community, and second, they share our appreciation for all things food. As their token Cuban friend, I felt a great responsibility to present the best of the best that my family has to offer, and my plan was to pull out all the stops. After all, when each individually asked me where they could find the best Cuban food in town, I boasted that no restaurant could produce the dishes made with love by any of the cooks in my family. So the bar was set pretty high. As our date approached, I thought long and hard about what I might include on the menu. The Cubans in my family, much like the Jewish people at large, are known for cooking in abundance. It’s as if we’re incapable of cooking just enough. There must be plenty in case people want seconds. 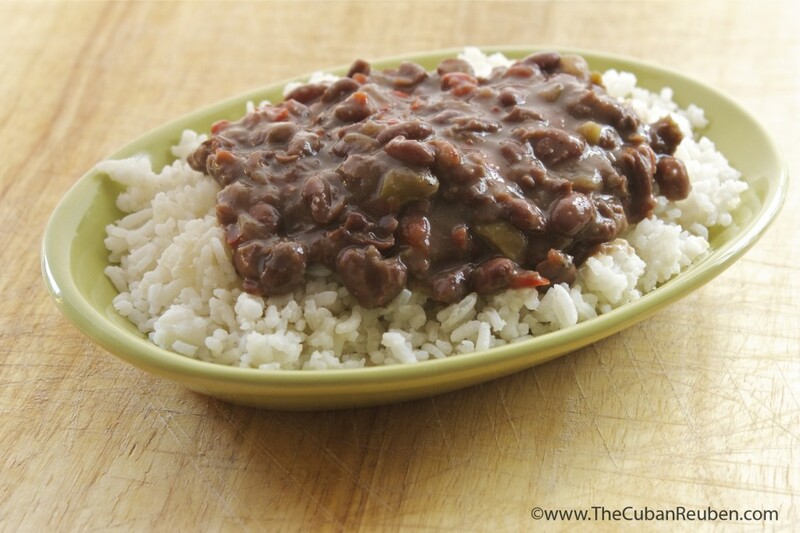 With this in mind, I knew which staple was not to be missed for my Cuban feast: Black Beans. Although a bit labor-intensive and time consuming to prepare, a single bag of beans makes a pot big enough to feed a small, hungry army. Also, the flavor you get from popping the top off a can of beans is no match for the slow-cooked, smokey, warm bite from the made-from-scratch variety. That being said, making beans from scratch is a serious commitment. To do them right, it takes two days of prep, which isn’t ordinarily my deal. But trust me when I tell you that if you’ve got the time, it’s totally worth it. Contents of the pressure cooker, before I added the liquid. The evening before the dinner party, Kenny got to work organizing the perfect soundtrack for the night, while I soaked the beans in a giant bowl of water. I left them to soak overnight, and in the morning, my beans had softened a bit, making it easier to pick out any rocks that made their way into the bag. 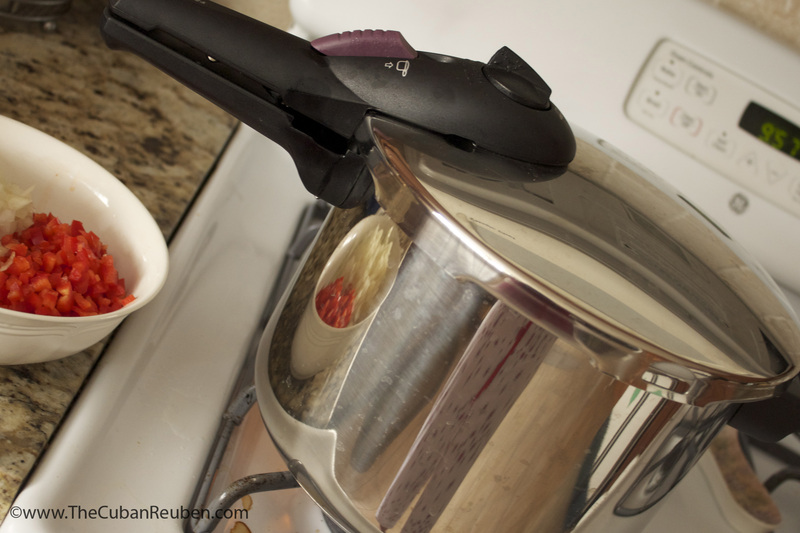 My handy dandy upper-cabinet-reacher, also known as my husband, graciously pulled down my pressure cooker, and I filled it with classic Cuban aromatics: garlic, onions, and bell pepper. I covered the beans with chicken stock, and threw in some bay leaves for extra love. Next, I let the pressure cooker do its thing, and awaited it’s solo. Once the cooker started to sing to me, I started the clock. Forty minutes later, the beans were ready for the next step. I am really good about doing the bulk of my prep work ahead of time on dinner party nights, mostly because I want to be able to enjoy myself with my guests. So, I had already prepared the sofrito that would be the base of the flavor profile in the beans. I let the sofrito of finely chopped garlic, onions, and bell pepper sweat, and then added the soft beans. You can’t have a pot of Cuban beans without the star: cumin. Cumin is what gives it that warm, smokey flavor without the kick of heat. After adding in a little oregano, salt and pepper, I was almost done. Cuban cuisine, much like its culture, is very much influenced both by the African and the Spanish people who inhabited the island long ago. This cross-section is ever apparent, particularly in beans, when we add sliced green olives. I could be wrong, but I don’t know of any other cultures that do that. Making mojitos for the group. Once the beans were simmering, I was free to move on to some of the other offerings of the night, and I wrapped up just as the guests started to arrive. Our home is sometimes hard to find, but they followed the scents of garlic and cumin wafting through the air, and the sounds of Arturo Sandoval and Celia Cruz serenading in the background. Dahlia and Elan brought us some fragrant mint from their garden, and with that, the mojitos were flowing. Some of the other tasty bites I served. Like the good hostess my matriarchs taught me to be, I wore a flower in my hair for good measure, and set out some appetizers while I finished up in the kitchen. As they got to know each other, Dahlia and Elan learned that they shared many more things in common with Jill and Ely than initially expected, and I could hear their stories and laughter from the kitchen. Shortly thereafter, I set out the dinner spread, and we sat down to eat. 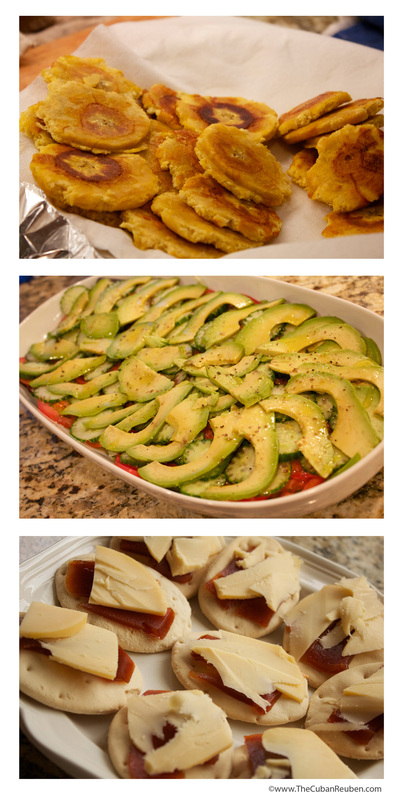 The feast included appetizers of sweet and savory pastelitos de pollo and Cuban crackers with guava paste and cheese. The main course featured my Cuban black beans with white rice, slow-cooked Ropa Vieja, succulent rotisserie Pollo Criollo with Mojo sauce, crisp, twice-fried tostones, and a salad layered with avocado, flower-shaped cucumber, thin slices of tomato and mixed greens. To cap off the evening, I served my famous flan. Each bite of the meal was met with happy sounds of appreciation, the kind that make my heart sing. I taught my friends that Cubans eat their rice and beans the way Americans eat their mashed potatoes and gravy. That’s how we can tell the real Cubans from the impostors at the Cuban restaurants. 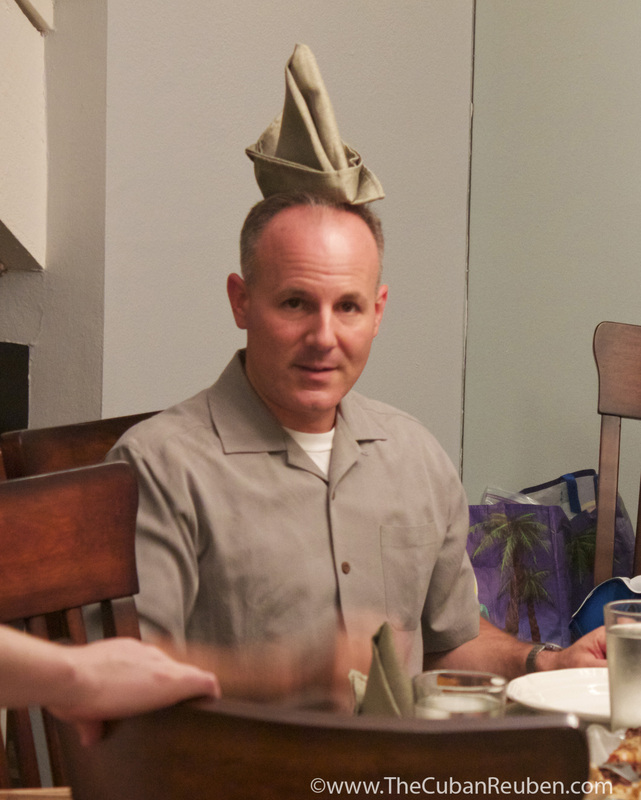 That night, my friends learned a little something new about me, too.The food I served was indicative of my unique family history. I love to cook, but the part I love most is sharing that passion with my friends and loved ones. Especially when they’re as fun and goofy as these party guests. Soak the beans in a bowl of water overnight, so that they have time to soften slightly. Drain and set aside. In a pressure cooker, add the drained beans, 1 onion chopped in large chunks, 1 bell pepper, chopped in large chunks, 1 head of garlic, peeled and left whole, 2 bay leaves, and enough chicken stock to cover the mixture with about 2 inches of excess liquid on top. Seal the pressure cooker according to the directions on your model, and cook on medium. When the pressure cooker starts making the “pressure” sound, cook for 40-45 minutes. Turn off the stove, and let the pressure cooker cool down before you open it. Once you open the pressure cooker, discard the large chunks of bell pepper, onion, and garlic, as well as the 2 bay leaves. Use a potato masher to slightly mash the beans, leaving some still whole. Set aside the beans. Create your “sofrito” by chopping the rest of the onion, pepper, and garlic into very fine pieces. In another large pot, heat the olive oil and add the sofrito. 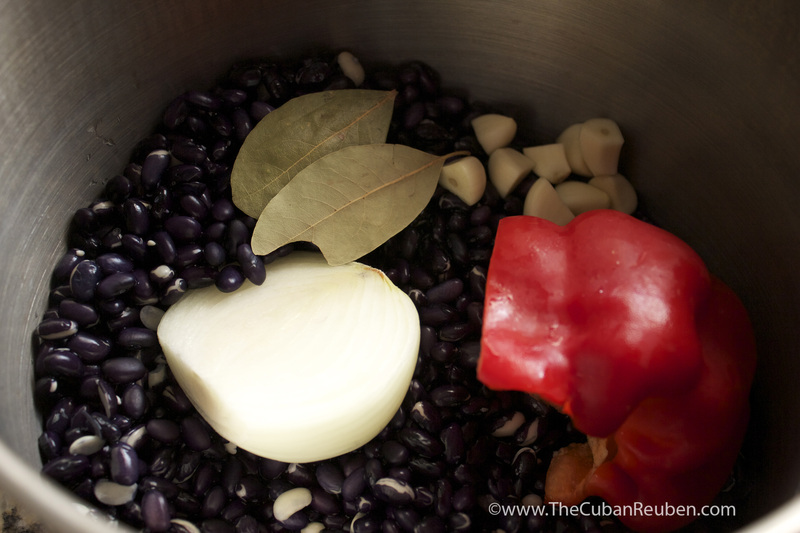 Once the onions in the sofrito are translucent, add the beans. 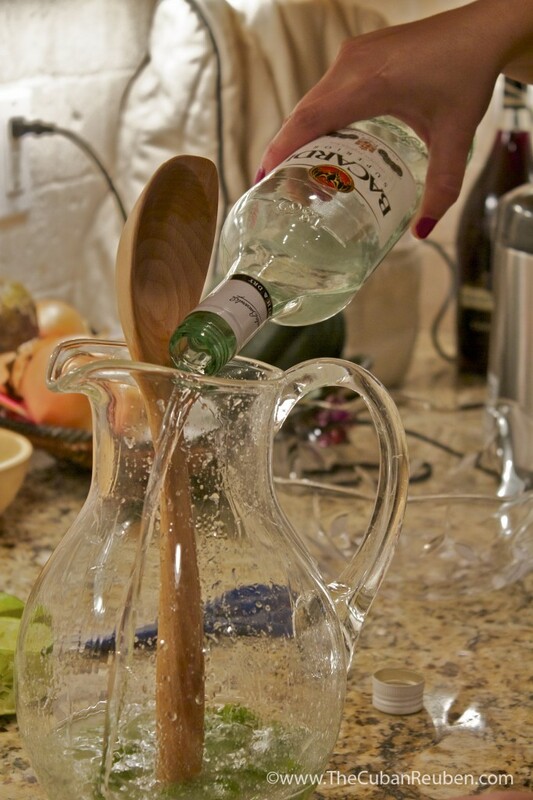 Add sliced green olives, including some of the liquid from the olive jar. Add salt, pepper, cumin, oregano and sugar to taste, and let simmer until the liquid reduces and desired creaminess is achieved. If you do not own a pressure cooker, use a regular big pot, and cook on the stove for 3+ hours, until the beans are soft. On a balmy afternoon in January of 1969, my mother and her family left their sprawling farm in Cuba for the promise of a new life filled with opportunity in the United States. Like many other immigrant families, they worked hard to assimilate into the culture of their new home country. My grandfather went to work at an automobile factory, while my mother and her siblings attended school in an unfamiliar language. With a picture-perfect house in a sunny southern California suburb, they soon morphed into a seemingly typical American family — but anyone invited over for dinner would quickly realize that their Cuban traditions remained. While her neighbors busied themselves by hosting cookouts on their backyard barbecues, my grandmother spent the better part of her day sweating over that night’s offerings, which she made with the produce from her small makeshift replica of the family’s old farm that she built in the backyard. Dinners featured classic Cuban dishes like starchy yucca smothered in sauce, cumin-scented black beans to drape over white rice, a fresh and crisp salad jeweled with plump slices of avocado, and aromatic and savory meat dishes, which slow roasted in her tiny oven — the scent wafting through the neighborhood like an unspoken invitation to come by for dinner. When I was little, I relished our weekly family dinners at my grandparents’ home. We would arrive before the meal and my grandmother always reserved a special task for me in the kitchen. 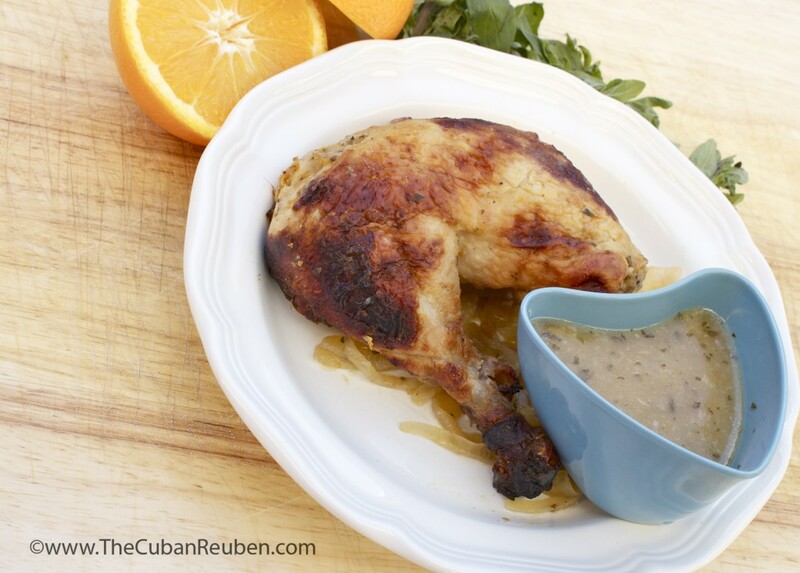 One of my jobs was to pick the sour oranges from the tree that were needed for the traditional Cuban mojo sauce, rich with citrus and garlic, which is served alongside most meat dishes. Unlike other varieties of oranges, sour oranges retain their pucker when ripe, making them ideal for marinades and sauces, but almost unbearable to eat raw. I remember taking great care to only select perfectly ripe pieces of fruit. They couldn’t be too green, as that might damage the branch, preventing future growth, and they dare not be too soft, as that meant the fruit had spoiled. The tell-tale sign of a ripe sour orange was the unmistakably technicolor hue of the peel and the ease in which it snapped from the branch. After I collected a few in my mini apron, I proudly presented them to my grandmother, and together, we’d get to work on the finishing touches of the meal. As the family gathered hungrily around the beautifully adorned table filled with platter upon platter of food, the mojo sauce would be ceremoniously placed in its reserved space between the aromatic roasted chicken and the rice and beans. Amid the cacophony of chewing mouths and generous displays of appreciation, my grandmother would pass me a secret smile, as we both knew the meal would not be complete without my addition. When my grandmother passed away, she left with me her legacy in the kitchen. These days, Shabbat dinner is hosted at my house, and while I don’t have a makeshift farm in my backyard, I do the best I can to honor the Cuban culinary traditions passed on to me from the previous generations. Chances are that if I’m serving aromatic roasted chicken, there will be a dish of mojo sauce alongside it — and we may even welcome some neighbors searching for the origin of the scents permeating the area. In a large plastic bag, squeeze the juice of the sour oranges (or oranges and lemons), add 3 minced cloves of garlic, 1 tablespoon of minced oregano, 2 tablespoons olive oil, salt and pepper. Add the whole chicken, seal the bag, and place in the refrigerator to marinade overnight (the longer this marinates, the better). The following day, remove the chicken from the plastic bag, and blot dry using paper towels. Meanwhile, in a small bowl, create a rub for the chicken by combining 2 minced cloves of garlic, 1tablespoon minced oregano, the cumin, salt, pepper, and 2 tablespoons olive oil. Massage the rub into the chicken, making sure to get the mixture between the skin and the flesh. Using kitchen twine, tie the legs together. In a baking dish, arrange the sliced onions in a single layer, and place the chicken breast-side-up over the onions. Add chicken broth to the dish, and cook in the oven for 30 minutes. Remove the chicken from the oven, and lower the oven temperature to 375. Using kitchen tongs in the cavity of the chicken, turn the chicken so it is breast-side-down, and replace in the oven for another 30 minutes. Remove the chicken from the oven, and baste with the liquid. Flip the chicken one more time so that it is now breast-side-up, and finish cooking for 30-35 minutes, or until its juices run clear. Allow chicken to rest for 15 minutes before carving. Serve with the roasted onions from the baking dish and mojo sauce. In a small saucepan, heat the olive oil over medium heat. When the oil is hot, add the garlic, and stir constantly, so that the garlic does not burn. When the garlic turns slightly golden, add the onions, and sweat until they are translucent. Add the oregano, sour orange juice, salt and pepper, and lower the heat to medium low. Simmer for 10 minutes.